Scott Braddock at the Texas Capitol. He covers the Texas Legislature and politics in the Lone Star State by working with Austin legend Harvey Kronberg to produce the most successful political newsletter in Texas: The Quorum Report. In January of 2015, Scott became Quorum Report Editor as Mr. Kronberg assumed the role of Publisher and CEO. 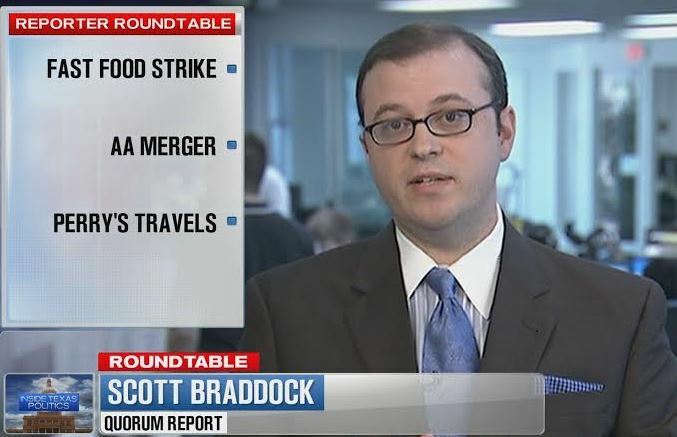 Scott served as the chief political reporter for the two biggest radio news operations in Texas: Newsradio 1080 KRLD in Dallas and Newsradio 740 KTRH in Houston. He has been honored with Edward R. Murrow and AP awards for investigative journalism and received recognition for excellence and fairness in political reporting from members of Texas’ Congressional delegation. 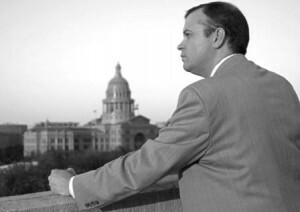 While in radio, he covered a broad range of issues with a special focus on education and immigration, two of the most important issues facing Texas and the nation. He also reported on stories of national importance including Hurricane Katrina, the BP oil spill, the prosecution of former House Majority Leader Tom DeLay, Andrea Yates’ release from prison, the death of Enron founder Ken Lay, and more. Scott has moderated political debates of all kinds and has served as an analyst of Texas politics on TV, radio, and in print. His many television appearances include WFAA Channel 8 in Dallas/Fort Worth, KTVT Channel 11 in Dallas/Fort Worth, Fox 26 in Houston, and national broadcasts on CNN, Fox News Channel and others. In honor of his many years of service to the Houston community, Houston Mayor Bill White declared April 11, 2008 as “Scott Braddock Day.” In 2013, Scott was named a “Rising Star” by the League of Women Voters of Houston Education Fund. 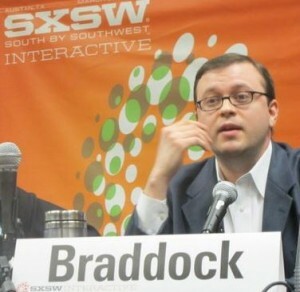 Scott Braddock speaks at SXSW Interactive in Austin. A product of rural Texas, Scott began his radio career at the age of 16 in Brenham spinning records (yes, records) and reading school lunch menus on the air. From that point forward, Scott was hooked. He developed a passion for broadcast communication. He was a disc jockey in Bryan/College Station and later transitioned into news reporting in both Washington State and California. Scott was born in Wharton County where he lived and worked on his family farm. His daughter, Carolyn, is the reason for everything he does.